The Social Fabric Initiative - Blog - Let’s not just say but also DO, shall we? Let’s not just say but also DO, shall we? Have you ever walked into someone giving away pamphlets or brochures, while you’re walking down the street? Ever wonder what you would look like doing that? Be honest, would it be a success, or would embarrassment overwhelm you? If your answer was no to the second question, I must tell you the truth: I shared the same thought; uncertainty was whispering in my ear and making me nervous. But, we (referring to my thread) had to get rid of every negative idea and just face the challenge that was in front of us: our Take Back Our Seas Project needed us! 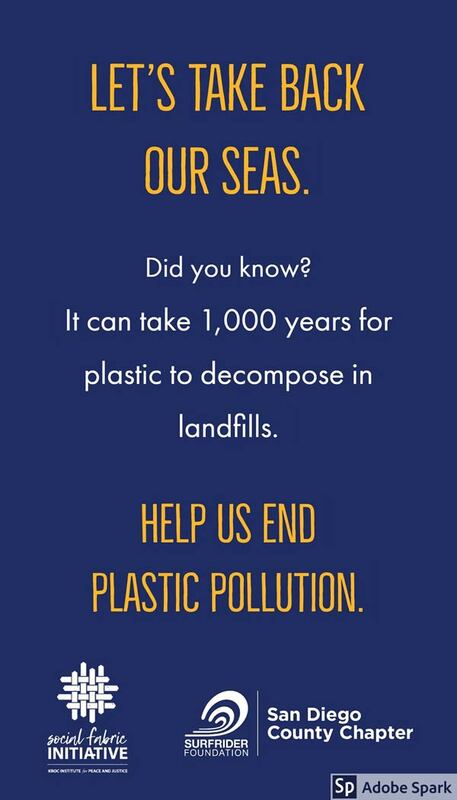 First, let me explain briefly what our Project is about: Take Back Our Seas is an awareness campaign about the effects of plastic pollution in our oceans. Since we want to see and continue to enjoy the wonders of our planet in the future, we are raising our voices so people can also be part of this change and take care of our environment. Our thread went to Ocean Beach, in collaboration with Surfrider Foundation, to participate in one of their routine beach clean-ups. Something really cool was the participation of Greenpeace in the clean-up - I mean imagine working side by side with a global environmental protection organization, that is something to brag about! It was also really incredible that people from 13 to 60 year-olds showed up and were really enthusiastic about cleaning the beach. I think I’ve been lacking details so I’ll try to be a little bit more specific: When I said I shared your opinion, I think you immediately knew what was I talking about. Yes my friends, our task was to give away brochures to people that were peacefully just walking on the sidewalk. I must say we weren’t necessarily given a simple job to do, not if you really want people to go away and consciously analyze the info you just gave them. Charisma, joy, confidence and some other qualities must be present. Like most of the things we do in life, there were some failures and successes. What do I mean by saying this? Some people were reluctant and ignored us, others would say “Yeah Bro, but I’d rather save some paper” without ever looking or reading at what we were handing them. We had better luck with other individuals because some of the people we talked to didn’t plan on participating in the clean-up and after talking with us they decided to join in. Also, there was this man that told us he really appreciated what we were doing and went over to Surfrider’s tent and donated some money. We were speechless and totally amazed. It’s fun; C’mon guys, you’re at the beach!! Mother Earth will thank you; every single action you do to take care of your planet does make a difference. Meet people with the same interests. I mean, really...is there something cooler than gathering with some folks that enjoy doing good things for others? As the title says, we didn’t just speak to people about plastic pollution and how it affects our environment, we also grabbed a bag, wore some gloves and picked up as many plastics as we could find. I think I can speak on behalf of my Thread and say it was one fun, awesome and different experience that kind of got us out of our comfort zone.